Crappie Cottage (named for the fish) is the perfect spot for a couples' retreat or a family gathering -- featuring fishing, swimming, and lots of spots to relax. Charming, but not rustic (WiFi, 3 LCD TVs, DVD), it's equipped with everything you need except food and bait. There's a covered boat dock for fishing and you can moor a boat dockside. There's a large swim dock next door for playing or sunning. Contact the owner before you book to verify availability and terms , thank you. If there are more than 6 of you, consider adding the ANNEX, which is a separate, private suite for two located next door. 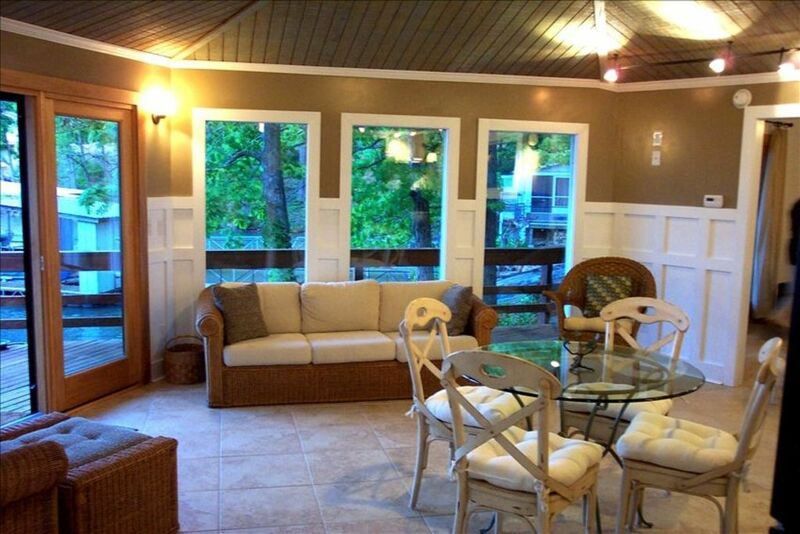 It includes a king bed, full bath, parlor, screened porch, patio and it comes with use of a golf cart. Horseshoe Bend is one of the nicest areas of the lake, providing golf and fine dining on the Bend and a wide choice of vacation activities within a 15 minute drive. If you rent the annex there is an additional bath. House is at water's edge; deck extends over lake. Table and umbrella for outside dining on deck or boat house. There is a kayak for use. Rafts and some life jackets available. Tie up boat at the dock. Fishing poles - fish from the deck or docks. We loved every minute of our stay at Crappie Cottage. The cottage was very comfortable and perfectly appointed, the view was beautiful, and the owners were wonderful in their communications. Everything was exactly as advertised. This cottage was well kept and had everything we needed for our family of 5. We did have difficulty finding the place and ended up at the owners place who helped us find where we were suppose to be. This place was perfect for our family. All we had to bring were clothes, food, and drink. Our kids who are 15, 12, and 7 had a blast swimming off the dock, fishing, and kayaking. The cottage sits on a quiet cove and the owners provided all sizes of life jackets, fishing poles, floaties, and a kayak. One other positive was that VRBO overcharged us which the owners found and promptly paid us back. We had an amazing family vacation here and have talked about making it an annual trip here. I would add the driveway to the cottage is steep so make sure you have good tires and/or 4 wheel drive. We have stayed here many times. It is a great place. The cottage is always clean and comfortable. It is very private. It has everything you need. Sleeps 6 very comfortably, 8 with the fold out sofa. The kids love the swim dock. Our friends come in by boat and there is a good dock for them to tie off. The decks give excellent added space. The owners are delightful to work with. They are honest and give their renters privacy. They have an annex apartment next to the cottage that is also very nice for an additional fee that sleeps 2 additional guests. The driveway is interesting. We loved our stay. Everything we could possibly need was available to us (except food and bait). My kids loved fishing off the dock and jumping in the lake whenever they felt like it. The cove is very peaceful with tons of privacy. We saw lots of deer and turtles which my two little boys thought was awesome. We would definitely recommend this place to anyone wanting a getaway. Great place, throughly enjoyed our stay. Minor improvements could be made to add the 2 stars. Access to the location is NOT motorcycle friendly and 4WD or AWD at minimum is necessary to safely negotiate the access road in and out of the property. The roadway is steep with sharp turns, but maintained. The house and areas were clean and all questions or needs were addressed in a timely manner. Very much enjoyed our stay at this VRBO. We found multiple (4-6) light bulbs burnt out in track lighting and/or area lighting simply not working and landscaping could use some attention as well, but the home was fully functional and very nice. This location is perfect for a fishing trip or family lake excursion. Would very much consider returning to this VRBO! Thank you for your feedback. Sorry about the lights and please let us know as soon as possible and we will correct. As to the landscaping, we are struggling to adapt the outside to less deer friendly plants. We start in the spring with beautiful hostas and roses and by early fall they (the deer) have bested out attempts. We will keep at in and appreciate your comments. My family (husband, 3 teenagers, and dog) and I thoroughly enjoyed our week-long stay at Crabbie Cottage in late August 2017. The cottage was extremely clean, bright, comfortable, and well-provisioned: there were ample towels, an emergency medical kit under the kitchen sink, and everything we could need for grilling. A looseleaf binder provided helpful information, such as operating instructions and restaurant recommendations. The owners responded to questions promptly (both when I e-mailed in advance or phoned once we were there) and did more than expected whenever a slight difficulty arose: e.g. Candy brought a suitable baking dish when I mentioned wanting to make a birthday cake and an extra electric fan in case we needed it. They were also very friendly! We spent most of our time hanging around inside or on the decks or taking advantage of the private dock, where we found a kayak and plenty of "toys" for playing with in the water. Our family would definitely hope to stay there again if vacationing in the area.